Yes, before paying the deposit you can cancel or make changes to my order. Can you help me with instructions on how to measure my windows and install my blinds? We custom install the blinds to keep the warranty valid and ensure they are kid safe installed. It depends on the product. However, it’s commonly 2 years for most products apart from Shutters which have up to 5 years. Timber Shutters offer a cordless option; how does this work? Plantation shutters do not have cords. They are instead controlled by moving a single slate in the open and closed positions. What happens with my old blinds or curtains? In most cases, you need to remove them yourself. Depends on the situation, there is a range of options. Call our offices for a consultation for more information. If I’m painting the house, what’s the best way to paint around the blinds? When painting, you would need to take down the curtains, blinds, and their brackets. What type of window shades are most effective to darken a room? Blockout drapes and padded pelmets are the best solutions to darken a room. 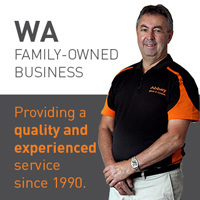 We service the entire Perth Metro area. From Mandurah to Two Rocks. We can go further by request. We have a mobile showroom. We come to you with our samples and experienced knowledge. How long does it take to manufacture custom blinds? Normally it’s a 3-week turnaround. The best solution is to contact us for a free measure and quote. We’ll come visit you, show you our range of products and samples, go through the options, and measure the windows to ensure they’re correct. Will it be possible to work within my budget? We try our best to offer very competitive prices, however, it does depend on what you require. All our products are custom made in Western Australia and are of top quality. How do I select the right window treatments? We work with the customer to help them select their ideal window treatments for their décor, lifestyle, and practicality. I have small children and pets in my home; do you offer products with their safety in mind? All blinds and curtains must adhered to the Australian standards for material and install. For more information, visit the Australian Standards Product Safety page. I have arch windows in my home, can those be covered? Yes, they can. Certain products can be custom made to suit even the oddest of window shapes. I purchased blinds from you several years ago. Who do I call if I need one repaired? Call our office and we’ll arrange an appointment to come out and quote to repair the blinds. My dog chewed on a few of the slates in my Vertical Blinds I purchased from you. Can I get replacement parts? Yes, you can. However, it depends on the age of the product. How do I know the blinds or curtain colour I see online is correct? Colour selecting online doesn’t always give a true colour example. We always suggest a home visit to show you the products in person. What products are recommended for kitchens and bathrooms with high moisture? Aluminium Venetians, PVC shutters or wooden blinds are all great options. We accept EFTPOS, Visa, MasterCard, cash, cheque – No American Express. Will I be able to install the blinds myself? Yes, but this could void the warranty. Our fitting / Install charges are very reasonable. Yes, GST which is shown on the invoice. Do you have samples you can send me? We can supply small samples for the sheers and drapes by request which we can have posted to you at a maximum of five samples. Heavy lined curtains can help reduce noise and soften a room’s acoustics. What product allows me to see out by day and also gives me privacy by night? Dual roller blinds provide this feature. What blinds are best for sliding doors? 8:30am – 5pm. We are very flexible so send us a message and we’ll get back to you asap. Our mobile showroom comes to you with a free measure and quote. What are the benefits of a mobile showroom? You can see the products in the comfort of your own home as well as how the colour will look. Our costs are reduced due to not having the overheads of a showroom, which then gets passed onto the customer. What is the easiest way to clean my blinds? This depends on the product. Call our office for advice. What do I do if my blind gets stuck?